Despite their modest circumstances, he's been grateful for the love of his plain but supportive wife, Sam (Malin Akerman), who bore him a beautiful son, Jonah (Skylar Gaertner). Career-wise, he's been happy having a steady job in real estate where he works alongside his blind BFF, Bob (Oliver Platt. But James' perspective of all of the above changes dramatically after he miraculously regains his sight. It's not long before he becomes more ambitious and demands a higher paying position. He also stops hanging around with Bob whom he accuses of now being jealous . 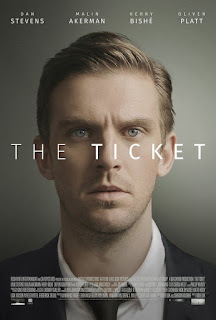 That is the intriguing point of departure of The Ticket, a n introspective, midlife crisis drama directed and co-written by Ido Fluk (Never Too Late). Once you're okay with the picture's novel premise, don't be surprised to find yourself sucked into its super-realistic, if harsh realities. How would you behave in James' situation? We all like to think of ourselves as far more virtuous than the creep he turns into. Yet, this thought-provoking character study suggests that you really might have to walk a mile in his moccasins to have a good idea.